While the Quad cities—which include Rock Island, Moline and East Moline in Illinois and Davenport and Bettendorf in Iowa—get a lot of traffic during warm-weather months, winter is a great time to head over there for a visit to its great indoor places. The the Figge Museum is one of those. Though located in Davenport, Iowa, the Figge Museum is a regional treasure and a top draw for anyone visiting the Quad Cities area in northwest, Illinois. Book a stay at Creekside Vineyards in nearby Coal Valley, Illinois, and you can pay a visit after breakfast one morning. 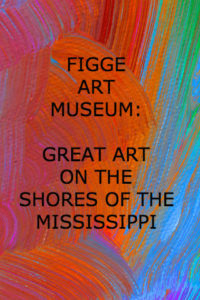 The Figge Art Museum is located in a stunning glass building on the banks of the Mississippi River, a perfect house for the treasures inside. The extensive collections are arranged into seven areas that cover regional, national, and international art from the 15th Century to the present. For instance, the American Collection covers the Colonial period to 1945 and includes a Midwest Regionalist Collection with artists Grant Wood, Thomas Hart-Benton, Stuart Curry, and others. Various galleries throughout delve into a wide range of works, such as: Frank Lloyd Wright and his designs, 19th Century American Art, Flemish art that grew out of religious reform, and a striking Haitian collection that highlights the bold and vividworks of that Island nation. You can break up your visit to the Figge with lunch in their lovely café. Stop in the Museum Store before leaving—it’s a great little place to find gifts. Figge Café, Tuesday – Friday, 11:00 a.m. – 2:00 p.m.
Just minutes away, you’ll find the Creekside Vineyards, which not only operates a winery and tasting room, but a delightful bed and breakfast too with four guest rooms. Enjoy morning breakfasts, complimentary wine tastings, a soothing hot tub, and lovely country views. Creekside offers several packages that make a visit even more inviting. 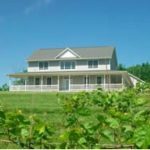 Creekside Vineyards is a member of the Illinois Bed and Breakfast Association and offer a unique lodging experience! This entry was posted in Art and Music, Illinois Bed and Breakfasts, Museums and tagged Art galleries, Illinois Bed & Breakfasts, Museums by admin. Bookmark the permalink.